Test in Clean and Boost. Create several Courses and assign different Course categories to them. Enrol a Student in each Course. Login as Student enrolled in the Courses. 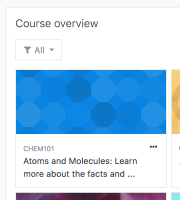 the Courses should be displayed in the "Course overview" block. make sure the correct course category name is displayed in every course block. Enable the "Display extended course names" setting (Administration > Appearance > Courses). make sure the correct course category name and the course short name are displayed next to each other in every course block. Test in Clean and Boost. Login as Admin. Create several Course categories. Create several Courses and assign different Course categories to them. Enrol a Student in each Course. Login as Student enrolled in the Courses. Go to Dashboard. 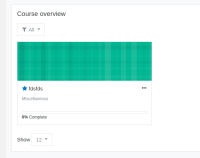 the Courses should be displayed in the "Course overview" block. Change the "Course overview" block view to "Card", "List" and "Summary" and in each view: make sure the correct course category name is displayed in every course block. Log in as Admin. Enable the "Display extended course names" setting (Administration > Appearance > Courses). Log in as Student. Repeat the steps 6-7. make sure the correct course category name and the course short name are displayed next to each other in every course block. 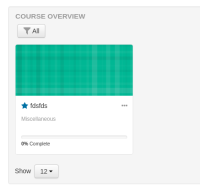 Look into the possibility of displaying the course category in the courses on the course overview block. This helps identify courses that have duplicate names.